Information regarding the Hy-Vee Healthy You Mobile and what services it offers. Since 2013, Hy-Vee has been on the road bringing health and wellness services to local communities through its Hy-Vee Healthy You Mobiles. Ever since Hy-Vee’s first bus was introduced three years ago, the demand for the mobile unit has continued to grow. 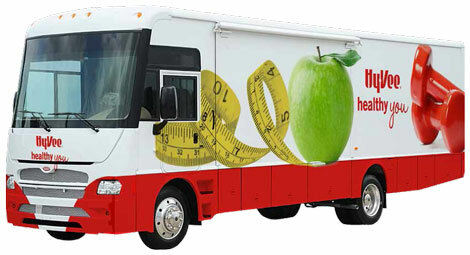 The company now has six Hy-Vee Healthy You Mobiles that travel across its eight-state region. Hy-Vee Healthy You Mobiles provide a way for Hy-Vee dietitians and pharmacists to reach customers across the Midwest by offering biometric screenings, flu vaccinations, nutritional information, cooking demonstrations, food samples and much more. The Hy-Vee Healthy You Mobiles travel from community to community and showcase various services at everything from health fairs to local festivals, charity events and school functions. The mobile health units were created to provide a safe and secure place for tests, immunizations, screenings and to demonstrate an overall commitment to improving the health of local communities by providing education and prevention services.